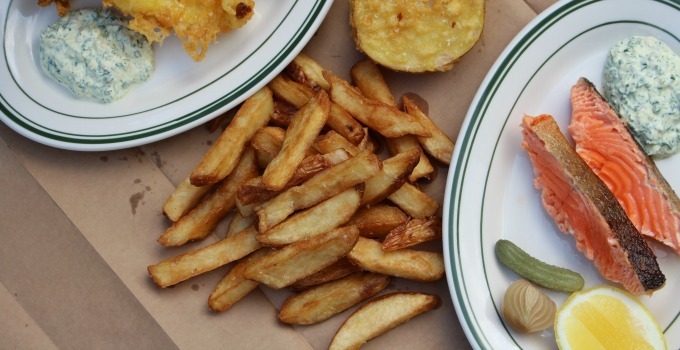 Attention my fellow aficionados; the foodie trends for 2018 are set and it turns out that old school is in – Ol’ School’s fish and chips that is. Tucked behind Fish Lane (what a koi-incidence), Ol’ School is bringing Brisbane what they call ‘casual, quality driven fish and chips’. And from this Friday they’ll be dishing out nostalgic nibbles that takes us right back to the good ol’ days when weekends were spent gorging on seafood and soda by the beach. The brainchild of the crew behind Vietnamese container restaurant Hello Please, Ol’ School is helmed by chef Jesse Stevens (previously from three-hatted Pier in Rose Bay). The focus is on super fresh seafood paired with what they reckon are the best thick handcut chips you’ll find, and classically flavoured with seasonings like salt, malt vinegar and lemon – just as it should be. Also making a splash and putting the ‘fin’ in fine is the restaurant’s crunchy fish tacos topped with guac, plus kraken-good prawn cocktail rolls on yummy milk buns. And what’s more ol’ school than washing it down with classic drinks like sasaparilla and creaming soda? Rounding it out, they’ll be krilling the dessert game with ice-cream sandwiches and buttery lemon tarts. With table service available Tuesdays to Sundays and bonus takeaway services on the weekend, Ol’ School is o-fish-ally the perfect place to drop in a line and hook a delicious meal! We hope sea you there! Words by Jacqueline Pon – the gourmand who’s already submitted her application for Chip Taster. - the gourmand who’s already submitted her application for Chip Taster.